We’re now on to the eleventh part of our series on K.J. Parker’s serialised novel, Two of Swords. Last time we checked in – just before Christmas – we’d left the rather smug Oida going one way, and a mysterious letter going another. In the tradition of the series so far, we follow the letter, and switch viewpoints – this time to Oida’s brother. As siblings go, Axeo is...well, clearly a reflection of his brother. I’m not sure I’d want to say which of them is a better or worse individual, but it certainly seems as if Axeo is rather more in the school fo dirty street fighting, rather than the covert operations we tend to see from Oida. He’s absolutely fascinating in his own right, though. An intelligent man, with a streak of, if not morality, then loyalty, he makes an excellent protagonist for this section. He’s joined by Musen, whom past readers may remember from other sections fo the narrative. He acts as a foil to Axeo’s more sophisticated and experienced persona, though remaining no less complex. Musen is learning the ropes of a more brutal form of operation to those we saw in Oida’s last narrative section. The contrast between the almost invisible approach led by Oida, and the more public, occasionally brutal approach of his brother is worth review. Musen remains a seemingly silent partner here, following the edicts of the mysterious ‘Lodge’ with very little in the way of question. Parker manages, however, to make Musen seem startlingly naïve in the complex arena of the…why...off his actions, whilst giving him a strong contrast in his competence in the how. This combination of zealotry and thievery is an absolute delight to watch – as is Axeo’s response, which is always unflinchingly unpleasant, whilst being (by his own lights) fair. This rather unlikely duo are involved in what might be called a heist. Despite the high stakes – life and death are held alongside a long running thread of tension – Parker manages to make their approach seem smooth, despite also indicating how the plan was put together. There’s some excellent tense moments here, as the two meander their way through various high security areas, using a combination of guile, lockpicks, and the occasional sharp knock to the head. It’s matched by some more of Parker’s typically excellent dialogue; the back and forth between Axeo and Musen manages to be cheerfully funny, with a fine undertone of menace throughout. They also get into some surprisingly complex issues around faith, power and responsibility in between high value thefts. Is it worth picking up? Well, I’d say so. By this point, you probably know whether you’re going to carry on with the series or not, but this instalment is still rather good. It made me laugh outright several times, and get strung out on the narrative tension but it also made me think – about the way people define themselves, about the way the world is structured, and about family. It puts a lot of depth into a small package, and that makes for an intriguing read. Monstrous Little Voices is a collection of fantasy stories set in the fictional world of Shakespeare, with a meta-narrative bonding the short stories together. The characters – well, they obviously vary depending on the writer in this shared world. It’s worth noting that some characters persist between stories, and the authors have managed to make their characters persist with them. It’s difficult to single out especially well drawn characters, but I particularly liked Foz Meadows’ flashbacks to The Tempest – showing us a tormented Prospero with a dark edge, and a Miranda who is an active participant in her own destiny. Both feel like the flawed aspects of humanity they aim to be. Similarly, Jonathan Barnes’s Macbeth is terrifying – an elemental force of rage and distate; however, Barnes finds a quiet locus of solemnity at the centre of the character maelstrom, making a gross harbinger feel at least a little human. 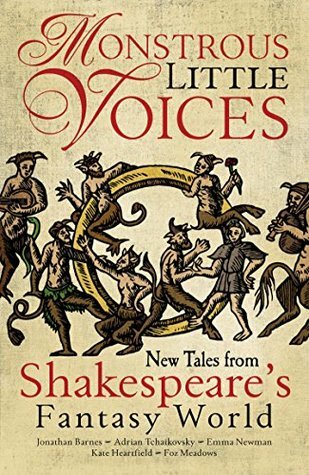 Across the stories in this collection, the main characters are well presented – growing out from their theatrical guises, rather than being defined by them. There’s a great many recognisable individuals here – Viola, Parolles, Orsino, and so on. Each will be familiar to students of Shakespeare, but works quite plausibly for those of us that are not. The plots – well, not to spoil things, but each story in the collection is self contained, though actions from each may make their consequences known in the next. There’s a good deal of variation, from Foz Meadows’s complex story of family, through stories of love and duty, and into Barnes’ climax. Each serves a different need in the dramatic structure, but each is equally compelling. Picking up the book, I could read each story out of order, and each one was sufficiently engaging to keep me turning pages. Taken together, they were a narrative gestalt – greater than the sum of their parts. Is it worth reading? If you’re a fan of Shakespeare, with a hankering for an expanded universe, absolutely. Some segments may offend the literary sensibilities, but it’s largely compulsive and intriguing reading. If you’re not much of a fan of the bard – don’t worry. Each piece of work opens on a world of fae, of compacts, of magic and blood, and affection spurned and love embraced. You don’t have to be a Shakesperean to enjoy the new worlds thrown open by this text. I’d say the stories within the volume are each highly enjoyable on their own, and especially so taken together – so yes, worth the read. Radiance is a book about many things. About the way people portray each other in film. About the way narrative shapes the world, in front of and behind a lens. About murder. About a sprawling solar system full of thriving life. About the mutability and debatable desirability of truth. And each reading gives another layer of meaning to the text, and opens up the story just a little more. It’s really rather good. 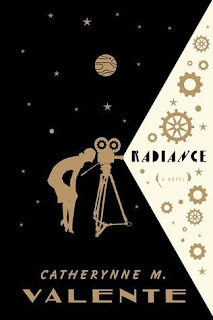 Radiance’s universe is a fusion of classical sci-fi worlds; the solar system is filled with habitable planets, from a verdant Venus to a frozen, gothic feeling Neptune. It’s to the author’s credit that each of these locales feels plausible, but also a blend of the human and the alien, surreal plates in a dark room not under the reader’s control. The prose that wraps the narrative is essentially a story in itself. The tale is told through different sources – diary entries, film strips and interview transcripts. This provides a string of different viewpoints, and makes each more unreliable. This is heightened by the use of a narrative within the narrative – a film which purports to retell the best possible version of the story, which switches effortlessly between genres. There are sections written as noir, others as a fairy tale, others as a cosy murder mystery. It’s an exceptional feat that each of these sections not only works as a piece of fiction for their particular genre, but that their manner of existing, their way of telling the tale, also affects the way the audience perceives it. We’re looking in at a story in flux, and the way that the story is presented is, in itself, a key part of the story. There’s a swathe of characters here, living across the entire first half of this alternative twentieth century. They have a certain sense of remoteness to them, once again feeling like they’re viewed down a camera lens. The reader is shown the masks that people wear, and the subtext, the connections between events, across decades, with characters shifting relationships, is left to the reader to infer, to tease from the strands of the provided tale, and form into something new. I’m still not sure I know these characters, but each of them lives in the text, and through their artefacts, they seem perhaps more real than they might if presented directly. The nominal plot surrounds the search for a missing documentarian, daughter of a film studio. There’s a swirl of threads around this apparently mysterious disappearance. The reasons gradually become clear – or at least clearer – over the course of the text, but a lot remains opaque, occluded by the distance of the sources, and by the need for each character to put their own spin on the story. There’s a solid surface mystery here, which may get answered to the reader’s satisfaction – but it’s got another set of skins beneath ; you can read the shapes of myth and legend between the quiet spaces in the words, or catch the dissolution of a family in a stray whisper, hastily scribbled on a diary page. There’s a lot to go through here – the prose is lyrical, dense, and seems to come with several meanings attached to each word. Is it worth reading? Absolutely. It’s shockingly clever stuff. You can take it as written, and it’s still a stunningly imaginative piece of work. But there’s depths here as well, which elevate it to a new level of experience. At the end of the day, it’s an intelligent piece of work, in a very original space, with a structure, characters and a plot which are utterly intriguing, and a thoroughly rewarding read. 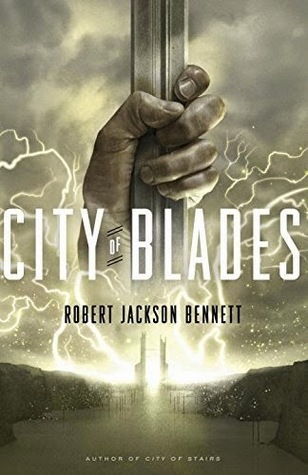 City of Blades is the sequel to Robert Jackson Bennett’s critically acclaimed City of Stairs. I reviewed City of Stairs at the end of last year, and have to say it thoroughly deserved all of the praise that it received. That meant I went into City of Blades with high expectations – and honestly, I think they were met. This time, we’re off to another city on the same Continent as before. Where the City of Stairs was a broken mess of confusion and a hotbed of insurrection, the new locale has a different feel. The shattered remnants of a port city, most of which was sustained by the local divinity, and now exists under water, are being slowly brought back to health through government reconstruction efforts. This thread of rebuilding, of revivification, sits within the centre of the narrative. Because whilst the city if being rebuilt, there are always individuals who would rather turn back the clock, or rebuild to their own design. Alongside the broken urbs , Voortyashtan also has a surrounding countryside, filled with clans more than a little hostile to occupying Saypuri forces. Bennett uses this as an opportunity to explore the tensions between the urban and the country, as well as between the governing and the governed. The broader geography also enhances the feeling of claustrophobia, as the Saypuri fort up in their…er...fort, whilst contractors begin tearing a new life into the city landscape around them. . Mind you, the setting isn’t all that the book encompasses, but it’s a vivid, living thing. A city wracked with tensions, in a countryside with several more. The City of Blades is alive – in some cases, rather unfortunately so. It’s a convincing construction, and this world of ruined divinity and fragile humanity is a treasure. In part, this is because of the characters it encourages. We’re reunited with the restrained violence of the taciturn General Mulaghesh for this narrative. The tone is distinct from that of the preceding volume. No less reflective, but drawn to different approaches, different modes of thinking obvious in action. Mulaghesh is given more room to grow here – the reader learns a fair bit about her past, and about the price that she’s paid, and is still paying, for the position that she occupies – and about the rights and duties that a person can impose upon themselves. Alongside the reluctant Mulaghesh are a whole swathe of new and diverting characters. I was particularly partial to her interactions with an old commanding officer – both having served in an apparently ignominious period of warfare years before the time period of the book. She’s prickly, but in some ways seeking approval and understanding, whilst he seems to have that knowledge, but is perhaps unable to use it for a purpose – a smooth talking individual with an iron-cast sense of rightness. There are others of course. For example, the existence of a Chief Technological Officer for the contractors restructuring Voortyashtan is a marvellous commentary on the shift in society compared to that of City of Stairs – but also gives us a view on a woman filled with focus, with resentment, with talent and drive, and with a need to see her goals fulfilled. Bennett builds characters that aren’t just the sum of their parts, but have the sort of deep contradictions and frailties which define humanit. It makes for deeply frustrating, but absolutely compelling reading. The descriptions Bennett uses are a startling, rich portrayal of the best and worst of humanity. I won’t get into the plot too much, for fear of spoilers. Mulaghesh is sent to (well, strong-armed into) the City of Blades to search for a missing Saypuri operative. As is traditional, this quickly becomes more than it appears to be. Suffice it to say that Bennett packs in quite a lot of change between the pages, and that it’s all extremely difficult to put down. There’s some seriously high stakes in play, and the pace, once it gets going is absolutely relentless. Bennett also does a superlative job at blending the character concerns with those of the wider world, giving the reader a stake in both the epic and the personal. It works beautifully, and you’re left with marvellously believable, complex characters in a world which is both broken and evolving – with choices to be made about exactly what sort of world it will end up being. Is it worth reading? As a stand alone, it’s a beautiful, complex book, with a lot of things to say about people, and the ways in which they treat each other, about occupation, about rebuilding, on a social and a personal level, and about the efficacy of gunfire when applied to a god. As part of the broader sweep of the series, it’s a very worthy sequel, and one I enjoyed immensely. It’s a book not afraid to talk in subtext and implications, or to explore larger issues whilst also deploying an intriguing plot. It’s stunningly intelligent, unashamedly genuine, and a thoroughly enjoyable read. I’d say, if you’ve read the first volume in the series, you owe it to yourself to go and read this, right now. 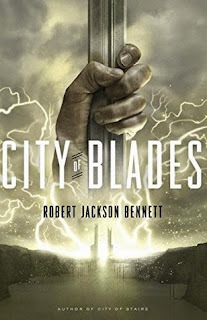 Tomorrow we're going to talk about City of Blades, Robert Jackson Bennett's sequel to his seminal City of Stairs. It has broken cities, complex characters, sarcasm, and the occasional gunfight. It's also very, very good. The Grim Company is the first in Luke Scull’s series of the same name. In a world with dead gods, those who killed them now rule in their stead, sometimes with subtlety, and sometimes with a hammer. In this system of semi-oppressive rule, we follow several individuals who are, in their own way, rebels. There’s monsters, there’s (quite a lot of) close quarters swordfights. There’s blood everywhere. Mad wizards, bad wizards, and mad bad wizards. It’s quite an adventure, somewhat reminiscent of Fafhrd and the Grey Mouser, with less lyrical prose and more stabbing. The world – well, as mentioned above, it’s one which is broken. Centuries prior, a cabal of powerful wizards stormed the gates of the realm of the gods, and cast them down – quite literally – into the world below, taking their lives in the process. The mages returned from their jaunt into the celestial somewhat changed, and quickly seized control of various parts of their world, drawing power from the corpses of the divinities that they struck down. In the current time of the novel, the world is, perhaps, not faring as well as it might. The rulers of several cities are in a state of near-war, each looking for a new source of magic to fuel their rule. At the same time, malformed monsters are coming out of the cracks in the world, and terrorising villages and towns, The average citizen is struggling to comply with whatever dictates come from their rulers, as those rulers are all that are keeping them from being devoured by the monsters – and those rulers are eccentric, to varyingly lethal degrees. Scull’s world is by no means a happy place. But in its hard-edged dreariness is the occasional sparkle. The shine of a magical spear as it punches through a monstrosity, or through the chest of a dissident. The gleam of the scales on a dragon, before it sets a village to flame. There’s an intertwining here, a sense of the beautifully grotesque, which made for an intriguing read. There’s also a sense of history to the places that Scull shows us – nations which have been under the same rule for centuries have a sense of being reshaped. Temples are decaying or eliminated, and there’s a sense of liquid history, of the victors rewriting perceived reality for their own purposes. Exactly what happened in the past is opaque, but it’s left a big mark in the world of the Grim Company. It’s a sad world of broken majesty and one that makes a terrifying kind of sense. The characters – well, we see a fair few, but the most memorable are the duo of battle-hardened, now almost pension-drawing northern warriors, and the youth who believes he’s the one chosen to overthrow his magelord – and has the arrogance, middling ability, and flat out luck to keep that belief fed. The world weary duo are a thoroughly enjoyable read – a fusion of competence, talent and experience with a gradual awareness of physical infirmity, and, in one case, a certain level of moral flexibility. The two of them interact well together, one a more compassionate, but still practical, foil to the potential inhumanity of the other. Scull sets out a portrayal of loyalty and loss with these two, and it’s one which is vividly plausible. The more youthful hero-figure is perhaps less familiar, and more prone to averting tropes, but still skilfully drawn. Having been told through childhood that he is a hero, chosen for great things, he believes it entirely – and has the youthful arrogance this leads to. He’d come off as a nasty piece of work, but as events begin to unfold, and his heroic talents are put to the test, he’s so dreadfully hapless as to be more amusing than annoying. What Scull’s done here is throw in the stereotypical hero archetype, but then laced it through with the flaws and difficulties that make a hero more human. It’s a less complex portrayal than the northern duo, but one which is no less convincing or enjoyable. The plot’s main focus is split between our barbarian duo, acting to disrupt a magical mine, and the efforts of the Young Hero to overthrow the magelord of his city. The two threads come together and disperse again occasionally, and both are compelling in their own way. I won’t spoil either, but would note that there’s some wonderful character introspection, betrayal, murder, a surprising amount of entirely non-prescription drugs, sieges, and more than one horrible monster. Overall, the text is a fairly fast-paced adventure piece, with some excellent character development inside it. 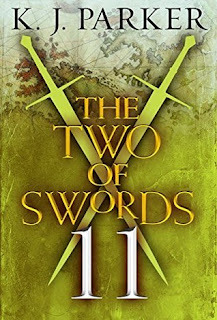 I’m looking forward to reading the sequel, and I’d recommend this one if you’re in the mood for a fast, gritty, fun fantasy adventure. We're back after our Christmas hiatus. 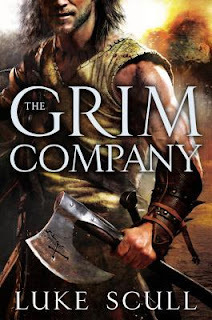 Friday we'll have a review of Luke Scull's "The Grim Company", the first in his series of the same name.